For the first time in franchise history, the Toronto Raptors were able to win the number one pick in the NBA draft. 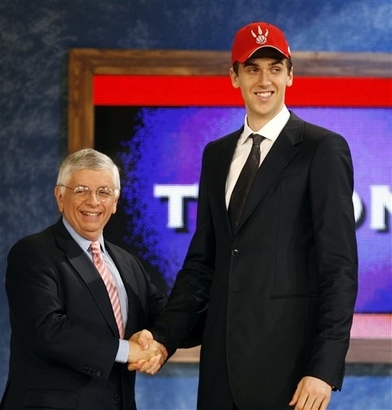 The team selected Andrea Bargnani, a 7 foot center out of Italy who had a knack for shooting the ball from long-range while playing in the Euro-League. Andrea has emerged as the go-to-guy on the Raptors and has become the new face of the franchise ever since Chris Bosh left for sunnier days. The pick still gets a little bit of scrutiny from fans considering All-Star caliber players like Brandon Roy, Rudy Gay and LaMarcus Aldridge were picked later in the draft. Bargnani may not have developed into the “Dirk Nowitzki clone” that many envisioned he would one day be, but he is still a tremendous player who remains with the organization to this day. 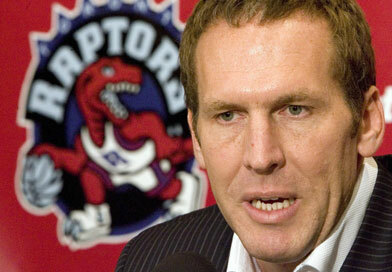 After spending 17 years with the Phoenix Suns, Colangelo would resign with the team from Arizona and sign on with Toronto one day later. This move gave the franchise instant credibility around the league as Brian was one of the more respected executives in the NBA. In Phoenix, B.C was the brain behind some of the major moves and signings that made the Suns a winning franchise, including bringing Amare Stoudamire, Shawn Marion and Steve Nash to the team. After fans had to endure an era of poor management by Rob Babcock, it was refreshing to see a new face take over the reigns who clearly knew how to run a basketball team. Usually a regular-season home victory wouldn’t be held with such high praise, but this is an exception to the rule. The 1995-96 Bulls are considered by many to be the greatest team in NBA history. They lost a total of 10 games the entire year. 1 of those losses came at the hands of the Raptors. A 109-108 edging of the eventual champion Bulls is probably the most memorable regular-season win in franchise history. How a team composed of players like Oliver Miller, Tracy Miller and Carlos Rogers beat a team with Michael and Scottie still baffles me to this day. Fans of the Raptors knew the day would come when CB4 would leave the city that made him a star. It was inevitable. It still didn’t lessen the hurt that came with the move though. 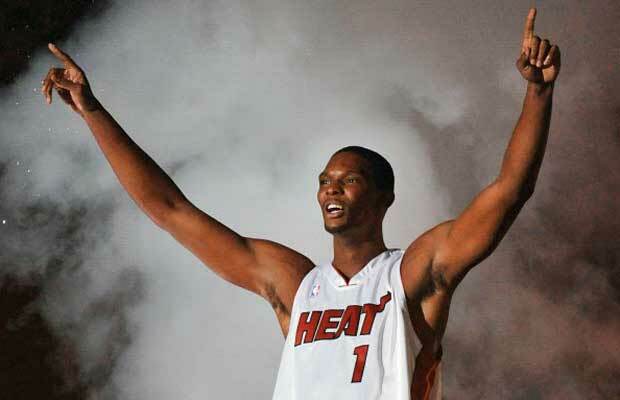 Chris Bosh was an unrestricted free agent and had every right to leave Toronto. On July 9 2010, Chris Bosh completed a sign-and-trade that sent him to South Beach to play with superstars Dwayne Wade and Lebron James. This left the Raptors in another state of rebuilding, with Andrea Bargnani and Demar Derozen thrust into bigger roles to fill the void left by arguably the greatest Raptor ever. 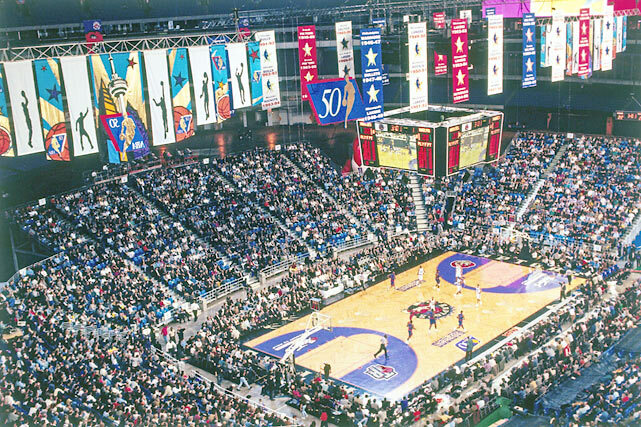 As part of the NBA’s expansion into Canada, the cities of Toronto and Vancouver were awarded NBA franchises, bringing the leagues total to 28. Out of a number of choices for the team’s name which included the Hogs, Dragons and Bobcats, the team chose “the Raptors” to be the name of the squad. The popularity of the film “Jurassic Park” helped with the decision to name the team after a dinosaur. Former Pistons point guard Isiah Thomas was appointed as the teams first General Manager. The team didn’t play their first game however until 1995. The rest is history. In what’s considered to be one of the greatest playoff series of the last decade, the Toronto Raptors got to within 1 game of the Eastern Conference Championship in 2001. The entire series came down to the last few seconds of game 7 when Vince Carter missed a three-pointer that would have given the team the win. Carter was later criticized for attending his college graduation ceremony on the same day as the game. This is the farthest the franchise has ever gotten in the playoffs and is considered to be the most successful team and run the Raptors have ever had. 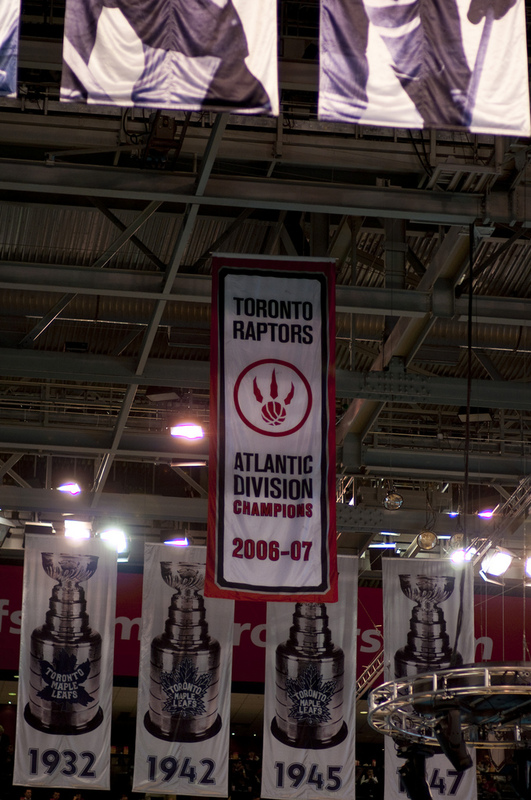 After starting the season 2-8, the Toronto Raptors would go on to tie a franchise record with 47 wins on route to the teams first and only division title in 2007. There 20 win difference from the previous season was the highest in the NBA that year. Not only did the Raptors win the Atlantic, but there coaching staff and upper-management were recognized for their great years as well. Sam Mitchell became the first coach in franchise history to win NBA Coach of the Year and Brian Colangelo became the first NBA executive of the year for the team as well. 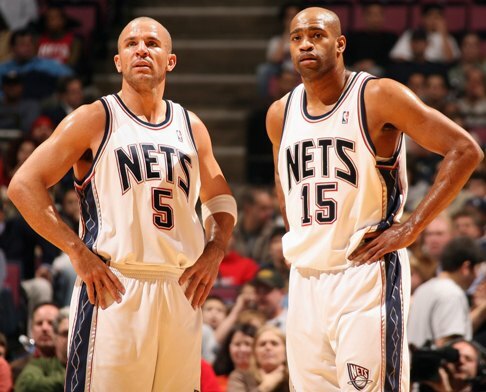 In one of the more lopsided trades the team has ever made, the Toronto Raptors would send franchise player Vince Carter to the New Jersey Nets at the end of 2004. The Raptors received Alonzo Mourning (who never played one game for the team), Eric Williams, Aaron Williams and 2 first-round draft picks. After being the face of the team since he arrived back in 1999, Carter had decided he had enough of the constant coaching changes and losing seasons and requested a change of scenery from the team. Carter would enjoy a career rejuvenation in New Jersey, helping to take the team to Atlantic Division titles and playoff appearances. The Raptors were left with little to no compensation for Carter and waited patiently until the Chris Bosh era was ready to commence. 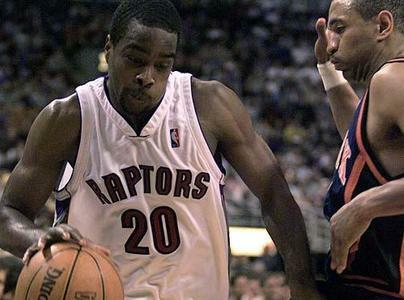 After being swept by the New York Knicks in the first round in 2000, the Raptors would come back and exact revenge against New York the following playoffs, eliminating the Knicks in 5 games. PG Alvin Williams would hit a jumper with seconds left on the shot-clock during the final minute of game 5 to put Toronto up for good. That jump shot should be considered one of the bigger shots hit in franchise history. The Raptors have made the playoffs on 3 other occasions, but have yet to win another series. and the single-most defining moment in Raptors history is…..
What would have become of Toronto if this trade didn’t happen? Unbenounced to a casual Raptor fan, Vince Carter wasn’t actually drafted by the Toronto Raptors. 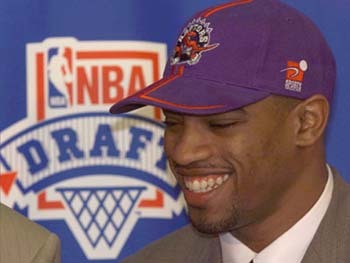 Antawn Jamison was the pick made by Toronto, but was later traded to Golden State in exchange for Carter during the 1999 NBA Draft. Antawn Jamison did turn out to be a very solid NBA player during his still ongoing career, but Vince Carter became the superstar that changed the face of Basketball in Canada forever. He is the biggest star the Raptors have ever had, and they almost didn’t end up with him. What do you think of my list? Did I leave any important moments off? 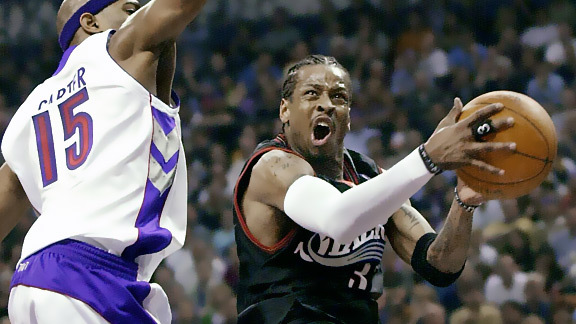 What would you say are the 10 most defining moments in Raptors history? This entry was posted in NBA, Walder Top 10 and tagged Andrea Bargnani, Basketball, Brian Colangelo, Chris Bosh, Damon Stoudemire, LaMarcus Aldridge, NBA, Sports, Top 10, Toronto, Toronto Raptors, Vince Carter. Bookmark the permalink. Thanks for the comment Steve! B.C does get a lot of slack for some moves he has made during his tenure, but I think it is safe to say that he is clearly the best GM the team has ever had. I didn’t believe Kobe scoring 81 on Toronto really qualified as a “defining moment” for the franchise. It was more pathetic then defining. It is a moment that the team would rather soon forget. Top 10 worst Raptor picks? I don’t know if I could find 10 that were THAT bad, but if I did make a list….